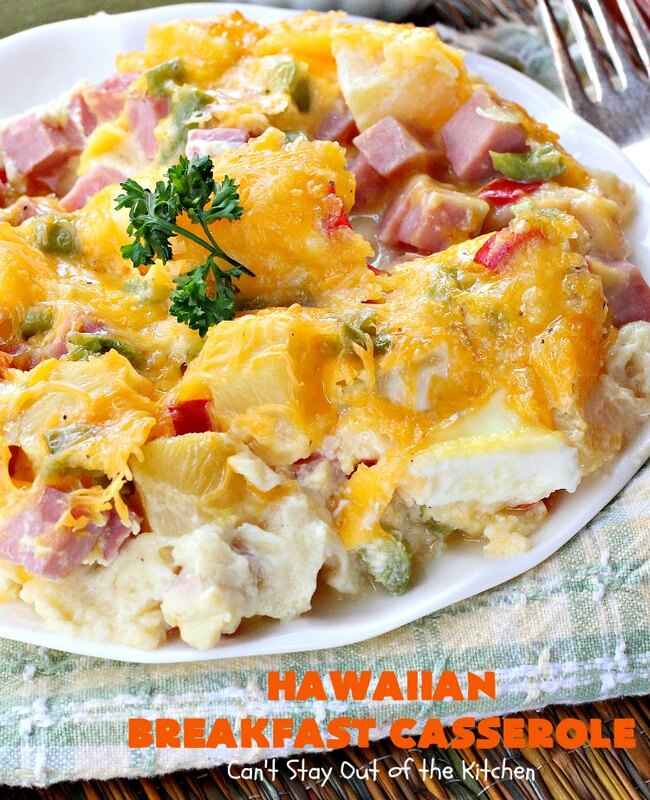 Hawaiian Breakfast Casserole is heavenly. Really. Don’t you just love King’s Hawaiian Sweet Rolls? These sweet rolls have always been some of my favorites for quite a while. I love making sliders out of them. They’re great to serve with soups, main dishes or salads. No matter how we serve them, they’re fantastic accompaniments to any meal. I decided to use some of my favorite rolls in a delicious Hawaiian Breakfast Casserole. It turned out to be a real treat. I hope everyone had a Happy Easter. 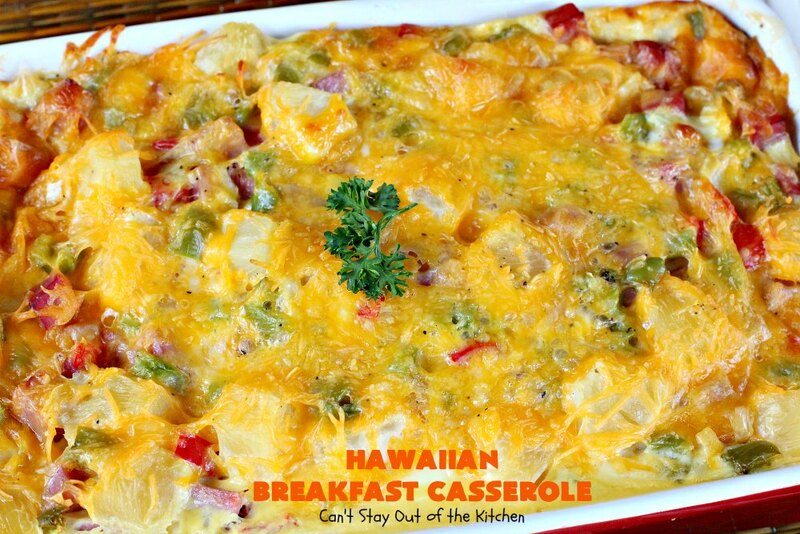 It’s a shame I didn’t get this recipe posted up before today because this would have made an excellent breakfast casserole for yesterday. Still, consider putting this on your Mother’s Day menu, instead! 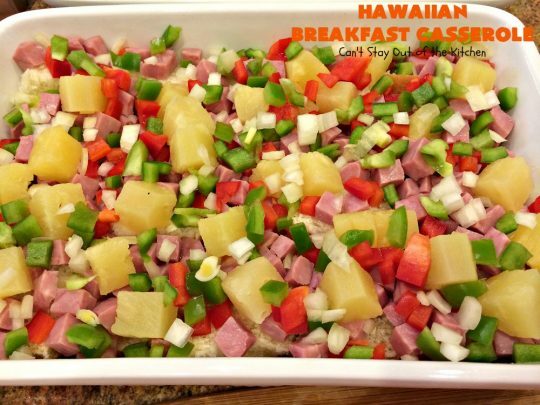 Hawaiian Breakfast Casserole is layered with King’s Hawaiian Sweet Rolls, ham, pineapple, red and green bell peppers, onions and cheese. Then it’s topped with eggs and milk that bake up into a scrumptious souffle-style casserole to die for. The sweet rolls and pineapple add a sweet touch to offset the savory flavors of the cheese, ham, peppers and onions. The outcome is breathtaking and marvelous. I was asked to provide breakfast for a Ladies’ Conference at our church for the last weekend in February. I had this recipe rumbling around in my brain for a while and knew I wanted to try it. But Dallas weather can be crazy in the winter. One day you may have an ice storm and the next day it’s 40 or 50 degrees melting all the ice and snow. While I originally planned to serve this for a Saturday breakfast to our ladies, we were iced in that day. So, I ended up serving it to our whole church on Sunday instead. 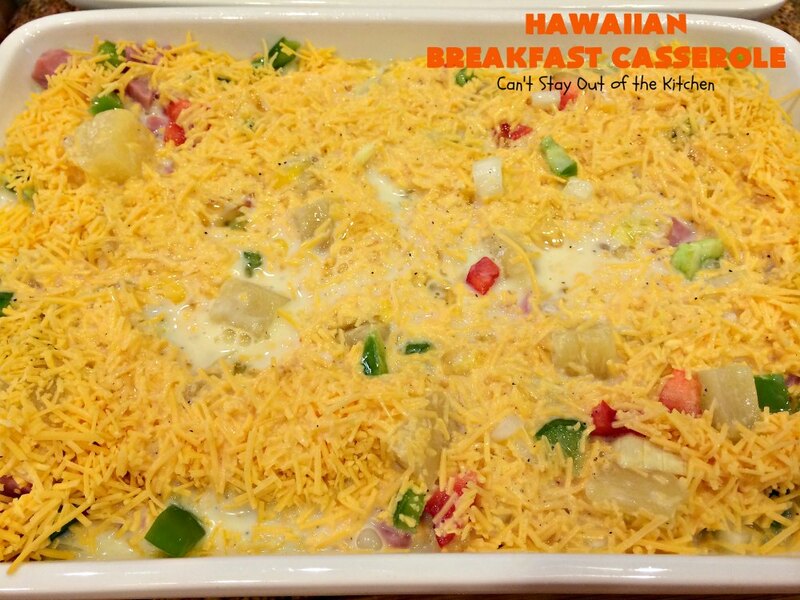 Hawaiian Breakfast Casserole was very highly regarded and enjoyed by all. If you’re looking for a fabulous breakfast casserole to make for Easter (perhaps next Easter), Mother’s Day, Thanksgiving, Christmas or any other holiday or special occasion, I can’t recommend Hawaiian Breakfast Casserole highly enough. It’s so delicious you will find yourself going back for seconds, and thirds…. This spectacular breakfast casserole is featured at All Free Casserole Recipes here. Hawaiian Breakfast Casserole starts with King Hawaiian Sweet Rolls for a slightly sweet and savory breakfast dish. Ham, pineapple, red and green bell peppers bake up into a souffle-type breakfast casserole with King Hawaiian Sweet Rolls on the bottom. 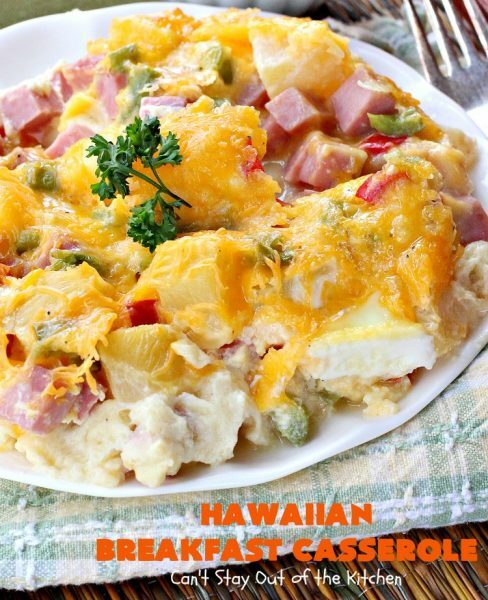 Each bite of Hawaiian Breakfast Casserole is amazing. Spray a 9×13″ glass baking dish with cooking spray. Slice sweet rolls in half and fit tightly into baking dish. (I used both sides of the rolls in the dish). 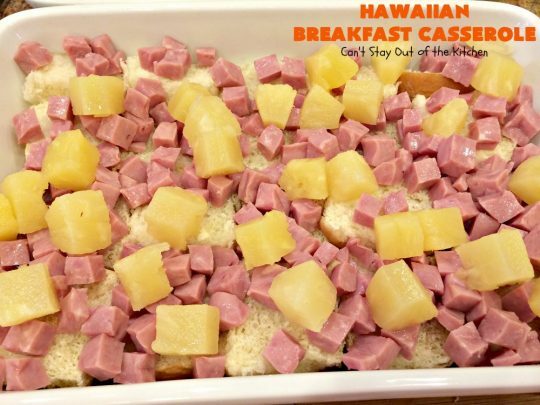 Layer with diced ham and chunk pineapple. Add diced red and green bell peppers and onions. Pour egg mixture evenly over top of cheese in baking dish. Cover and refrigerate overnight. Bake, uncovered, at 350 for about an hour or until hot and bubbly. 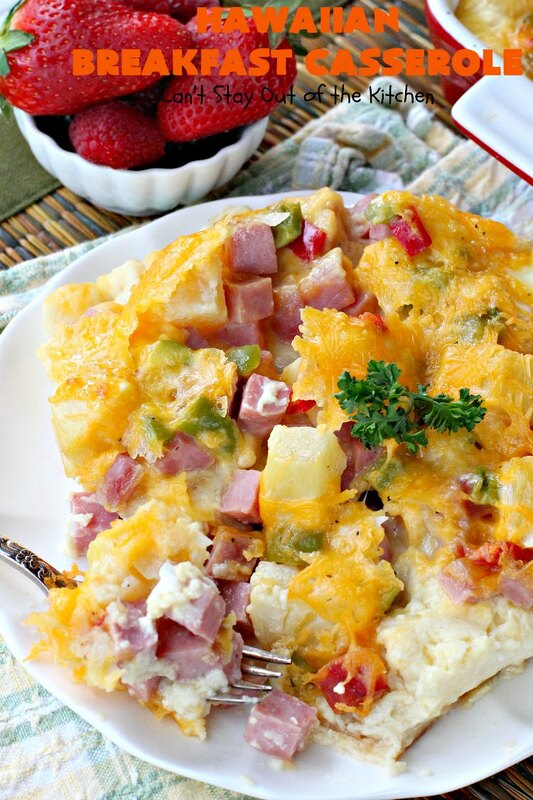 This breakfast casserole is terrific for special occasion or birthday breakfasts too. 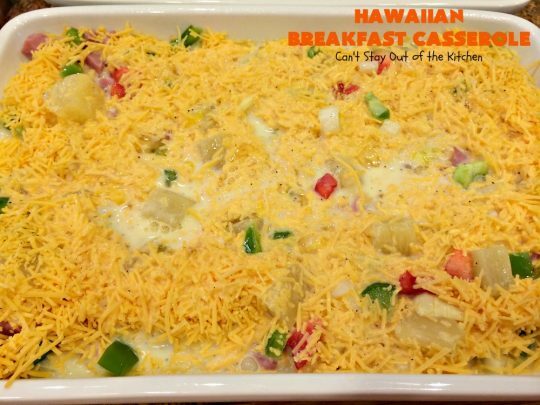 Serve Hawaiian Breakfast Casserole with fruit and muffins for a wonderful country-style breakfast. Hawaiian Breakfast Casserole is a great breakfast dish for Easter, Mother’s Day or other special occasion breakfasts. 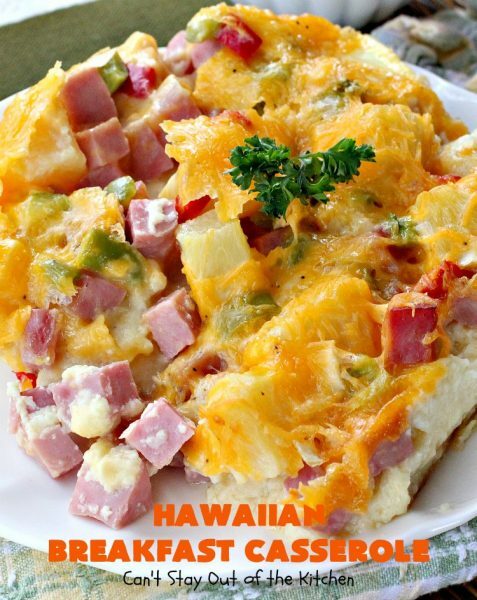 This delicious breakfast casserole uses King's Hawaiian Sweet Rolls, ham, pineapple, red and green bell peppers, onions and cheese in a scrumptious souffle-type dish. 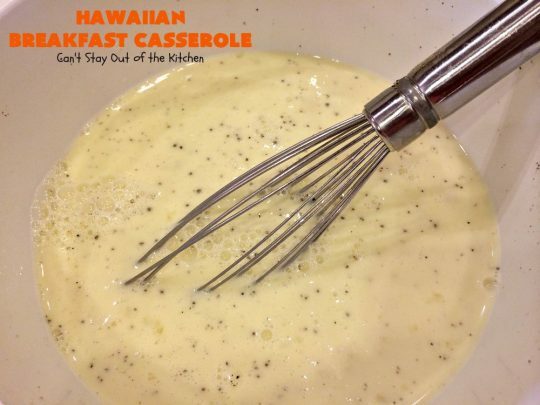 Great for holiday breakfasts. Slice sweet rolls in half and fit tightly into the baking dish. (Cut in strips if necessary and wedge rolls to fit baking dish). Sprinkle ham over top of sweet rolls. Sprinkle red pepper, green pepper and onions over top of the pineapple. Spread cheddar cheese over all. Whisk eggs in mixing bowl. Add milk, salt and pepper and whisk again until well combined. Pour milk mixture evenly over top of casserole. Bake, uncovered, at 350° for about an hour or until mixture is set. NOTE: Preparation time does not include time required to refrigerate casserole over night. 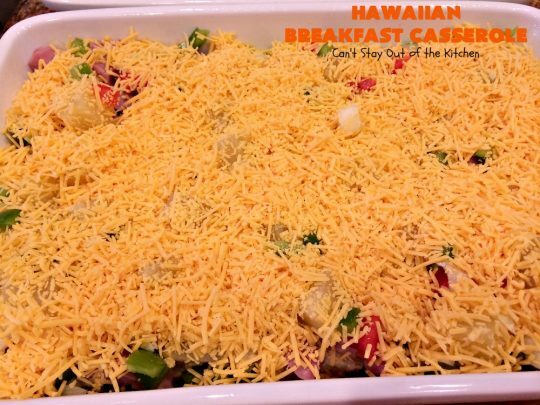 This delicious breakfast casserole uses [url href=”http://www.kingshawaiian.com/?gclid=Cj0KEQjw3M6oBRDnnIywo5i287ABEiQAXRm7SyBVuj5PaxeBktzyj_SZmCPfd3vUbrqIzxbA4HD0Zd0aAqlp8P8HAQ” target=”_blank” title=”king’s hawaiian sweet rolls”]King’s Hawaiian Sweet Rolls[/url], ham, pineapple, red and green bell peppers, onions and cheese in a scrumptious souffle-type dish. 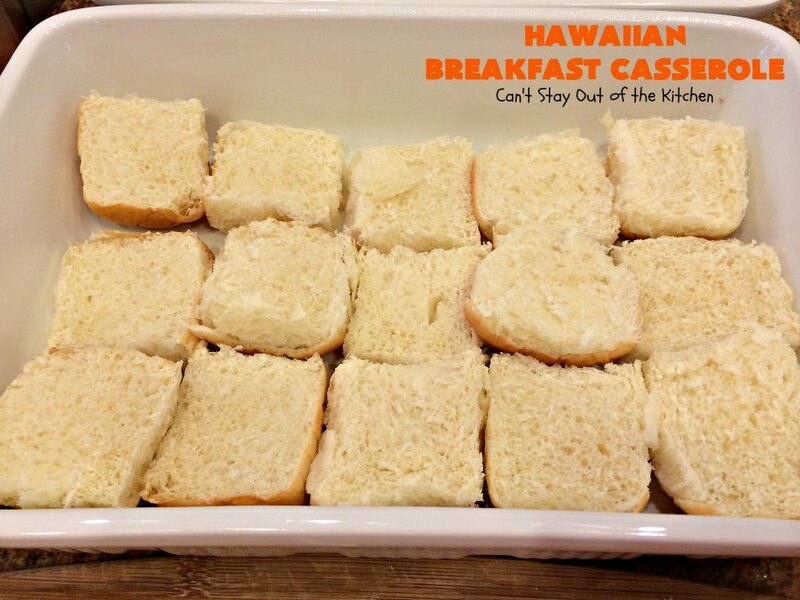 Great for holiday breakfasts. Preparation time does not include time required to refrigerate casserole over night. This is a great casserole to make for special birthdays or anniversary breakfasts. Hawaiian Breakfast Casserole can’t be beat. 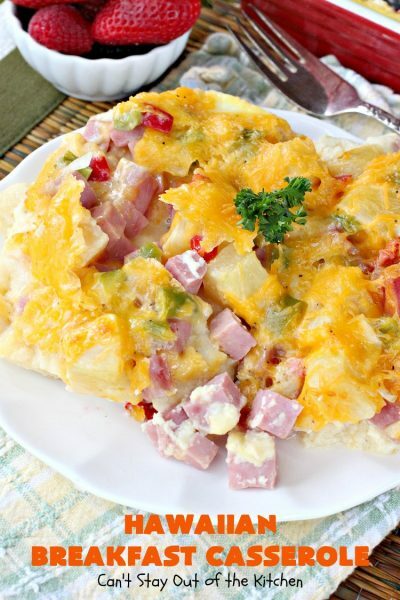 If you enjoy ham and pineapple, you’ll love this breakfast casserole. I have a question, it says to cut the rolls in half and fit in bottom of pan. I am confused as to do I use both halfs in the bottom? I made the casserole and only used half of the rolls, and it was fine, but should I have used both in bottom? Hi, Janie. When I cut the rolls, I wedged both tops and bottoms into the bottom of the pan. I hope that makes sense. Enjoy the recipe. 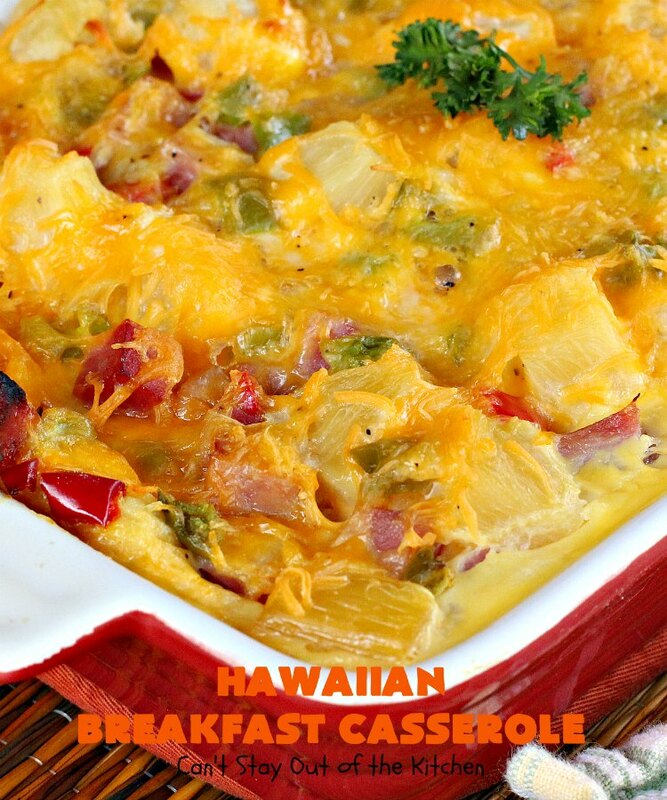 This breakfast casserole would be great for any holiday! 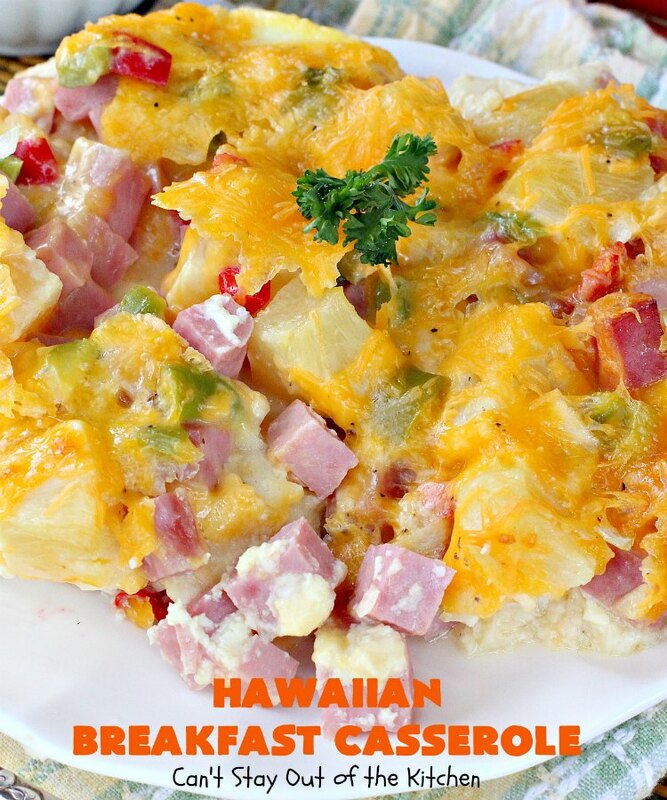 I love a breakfast casserole but have never made one with Hawaiian Breakfast Rolls, Sounds delicious! Thanks, Christin. I have never tried using Hawaiian rolls before either, but it turned out wonderfully. Hope you give this a try for a holiday breakfast soon. Thanks for stopping by. 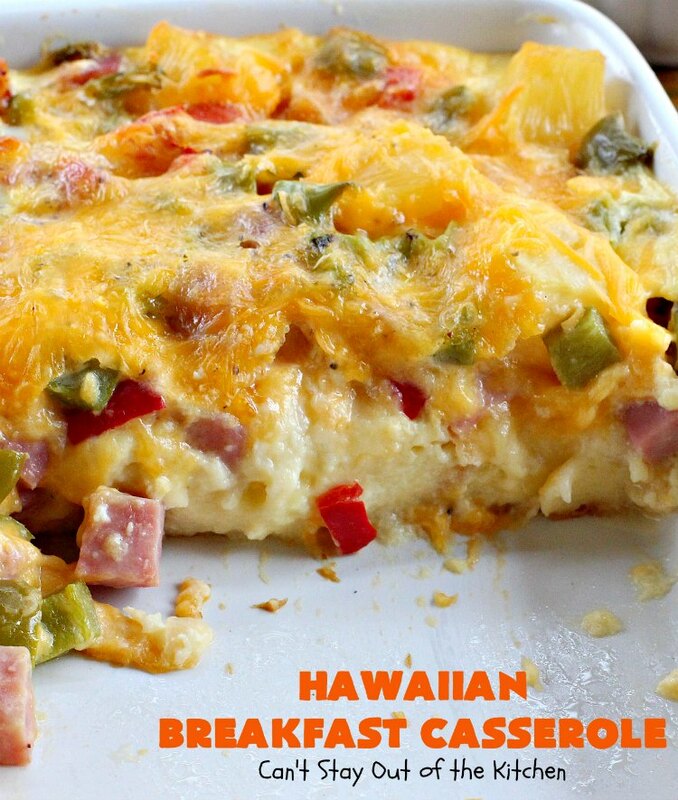 That Hawaiian Breakfast Casserole is making my mouth water! It really does make your mouth water! I hope you give it a try. Thanks, Kim. 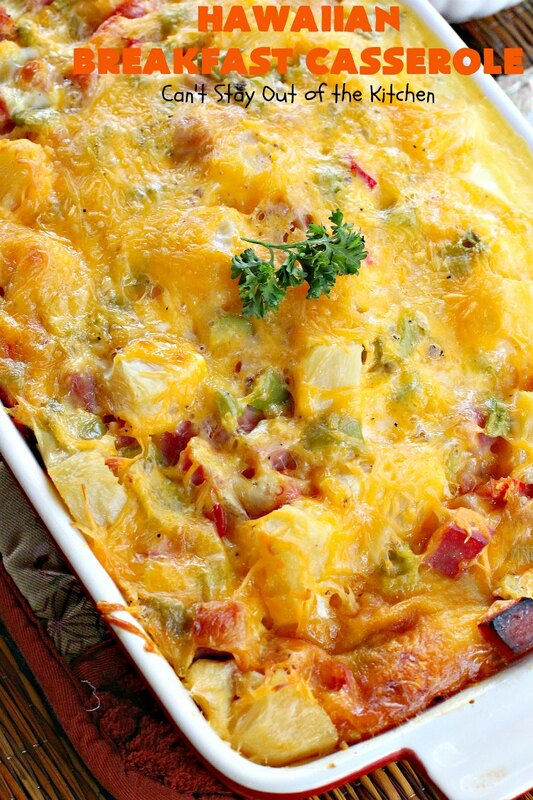 You will LOVE this great casserole. 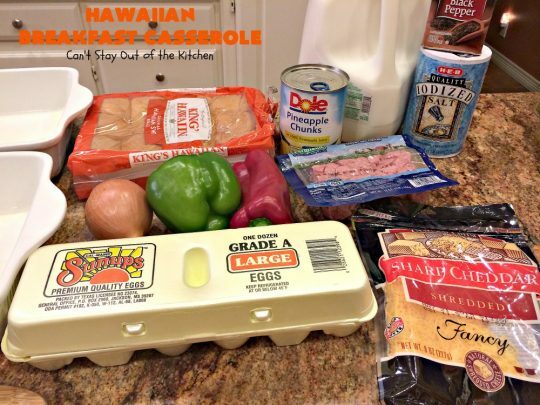 Even though it has a little bit of sweetness from the pineapple and rolls, guys love this recipe, too. Hope you enjoy.